It's 1996, and when Emma's dad's new wife has a baby, she gets her first desktop computer from him. She fires it up, and with the America Online CD-ROM given to her by her friend and next-door neighbor Josh, the two of them log on to the internet…only to find the page that comes up is Facebook—fifteen years into the future. At first they're convinced it's a joke...Josh really won't end up marrying the hottest girl in the school, who, before now, has never even spoken to him, will he? And Emma would never be so unhappy, right? When it becomes obvious that this Facebook thing isn't a joke, but the actual future, both Emma and Josh start acting differently...changing their Facebook pages, and their futures. 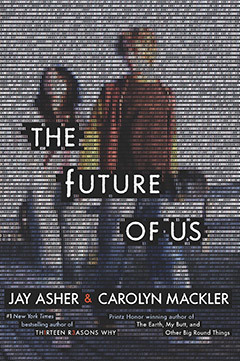 Jay Asher and Carolyn Mackler have created an awesome and inventive book in The Future of Us! Both are excellent writers and they seamlessly piece their own styles and voices together to create an accessible and fun book that teenagers today will have no trouble getting into, despite being set in 1996. They've got the dialogue, the emotions, and the drama down perfectly. The dynamics between Emma, Josh, and their close friends were excellent. Each have their own relationship dramas that play into the futures that Emma and Josh see on Facebook, and as they try to "fix" things, they discover that more issues crop up, leading them to the realization that while you can't control the future, you have the power to change your own life, and if you live your life trying to control what may happen, you won't really enjoy living. The little details about life before everyone had cell phones, Facebook pages, and tablets are kind of fun for those readers who remember the '90's and the pop culture of the time, but even if you don't, The Future of Us is still an engaging, fun book with plenty of humor, relationship drama, and just enough romance to satisfy teens and adults alike. Definitely do not miss this book. Cover Comments: I like the cover! It;s neat how the pair on the cover aren't totally visible, and I think the design of the cover is really neat! I also like how it's not overly feminine, so I hope both males and females will be encouraged to pick it up! This ones hits stores on Tuesday! I didn't know this book was set in 96! I remember that time! I was like, eleven and it was fun. So glad to see this one lives up to the expectations! :D thanks for the review. I'm excited for this one. Glad you liked it! I'm looking forward to reading this book. It's different from most other books in this genre. I enjoyed this one, thought it was very entertaining. It was a little fluffier than I would have liked but all in all I really liked it.